Yes, I’m aware it’s June. And yes, it was rather humid and hot today. But, yes, I still had soup! And a delicious soup at that. 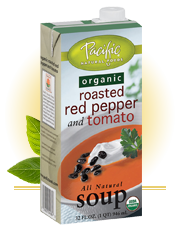 Pacific Natural Foods sent me some of their soups to try, in really cool flavors like this one. Organic Roasted Red Pepper and Tomato Soup- how yummy does that sound! This soup is also all natural, gluten free, and organic. So, I heated up this soup and shared some with my parents. At first, I didn’t really know what to expect- I mean, I’m not really a tomato soup girl. I was always more of a vegetable or noodle based soup- something with something in it to chew. But I’m glad I tried this one- it was actually quite good! I poured it in the bowl and noticed it looked like a nice, creamy soup. Not your typical watered down soup in a can. Then I tasted a spoonful once it was heated up- uh… YUM!! Totally not what I expected! It had a very surprising buttery and cheesy taste to it- absolutely delicious! No overpowering tomato or red pepper taste- but just a very enjoyable and flavorful soup. My parents also enjoyed this soup, and when my dad commented that it wasn’t too salty, I was shocked to see there were 720 milligrams of sodium per serving! I would have never guessed! 1 serving (1 cup) is 110 calories, 2 grams of fat, 16 carbohydrates, 1 gram of fiber, 12 grams of sugar, and 5 grams of protein. It also provides 15% of your daily needs of calcium. Woo hoo! Organic reduced fat milk, Filtered water, Organic tomato paste, Organic caramelized red pepper flavor (organic red peppers, sea salt, organic butter), Organic evaporated cane juice, Organic roasted garlic, Organic roasted red peppers, Sea salt, Sodium citrate, Organic rice flour, Organic garlic powder, Organic onion powder, Organic spices.